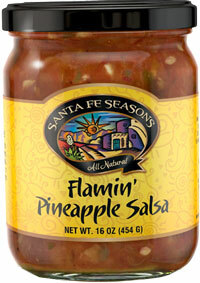 Smoky like the Fire Roasted Salsa, this salsa adds the rich sweetness of juicy pineapple. It's a natural with grilled shrimp or Tacos al Pastor. Put a new twist on the holiday ham. Tomatoes, crushed pineapple, chipotle chiles, onions, garlic, cilantro, vinegar, sucanate (100% dehydrated sugar cane juice), and sea salt.